For Dave Ross of Brockport, cycling on the Erie Canalway Trail is the best way to spend time with family and friends. The opportunity to also help other trail visitors along the way led Dave and his friends to become Canalway Trail Ambassadors. 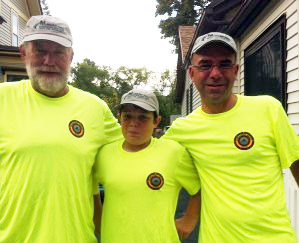 Since 2010, Dave, his friend Dennis Miller, and Dave’s son Hunter have served as Trail Ambassadors for the section of trail from Spencerport to Holley west of Rochester. During the week, each person may make several solo rounds on this section, but the group rides together most weekends. However, the men’s dedication to the Canalway Trail is not limited to the Trail Ambassador program. Dave, Dennis and Hunter also adopt THREE sections of the Erie Canalway Trail, two with individual members and another with the Can-Ale cycling club. “Maintaining the trails is a great way to help keep our trails clean and safe. We really enjoy looking after our trails. We have had a lot of community members volunteer over the years after seeing the event on the website,” added Dave. Canalway Trail Ambassadors are volunteers who ride patrols on the Canalway Trail. Parks & Trails New York, in collaboration with the Canalway Trails Association New York (CTANY) and the NYS Canal Corporation, initiated the Canalway Trail Ambassador program in order to provide a “presence” on the trail and enhance the experiences of trail users. The program began in Schenectady and Albany Counties in 2008, before expanding to Monroe County. Ambassadors are on the trail from spring to fall, although some extend their riding season well into the winter. The role of a Trail Ambassador is three-fold: to assist and inform trail users, monitor trail conditions; and promote courteous and safe use of the trail. Ambassadors usually wear an easily recognizable shirt or vest and carry basic supplies and PTNY’s Cycling the Erie Canal guidebook. Along with their knowledge of trail sections and local amenities, Trail Ambassadors provide motivation to those embarking on an End-to-End journey on the Canalway Trail and information on how to register for the End-to-End recognition program. Go Dave, Dennis and Hunter! Thanks for all the work you do for the Canalway Trail, and we hope that you continue to ENJOY THE RIDE!